My phony-looking cosmetic dentistry, but my dentist tells me I should love it. This is a follow-up from B.C., and some dental implants work that she is very unhappy about, but her dentist thinks it looks great. Thank you for such a quick response. I have been so upset since yesterday morning my pictures might not represent well, I took one as soon as I got home and then compiled an email to her and took two more just now, I hope they give you enough of an idea to be able to tell me what you think. A little background – In 2000 – 2005 I was pretty sick for those few years and until I was well again I didn’t know I had serious peridontal disease. I was referred to Dr. — and she started treatment 2007 up until now. The real problem has occurred over the last year (since last Oct.) when she started the treatment (implants) for the top and bottom front. (There is some other treatment scheduled to be done on the back top and bottom later this year). Until I found your site I had no idea that it could go so wrong. This dr. talked to me extensively about her experience and quality work and told me that it was very important to her for me to be happy with the results. I realize now she is not a true cosmetic dentist. She followed none of the protocol I read on your site and you can see the results. Which she is making me feel crazy that I should be happy with them – but I have an appointment tomorrow AM with a doctor from your site for a consult. The following is what she emailed me back. “I received your e-mail. 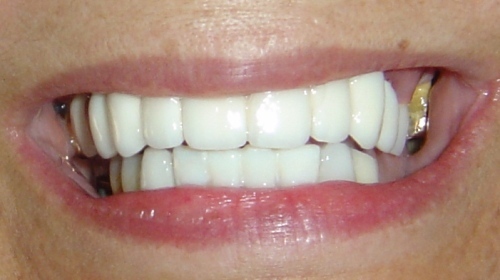 I was very surprised of the comments made regarding your upper implant bridge. “My professional opinion on your upper implant teeth is that they look very nice and in proportion. Note the nice shape and contour of the teeth. “I would like you to know, it is my professional opinion that your upper implant bridge is very nicely and professionally done. I like the shade and the contours. However, I will extend your opinion to Todd my lab technician and see what he can do about it. Yes, I can see what you are saying. While the teeth don’t look bad, they are very bright white, and they are a little large looking. They are also somewhat monochrome – meaning the color is flat and not blended like real teeth. But in her defense, they look okay, and they would be exactly what some patients would like. However, they’re not what you like. A true cosmetic dentist would not have cemented them with the reservations you expressed in your earlier e-mail. Your smile is an expression of your personality. These teeth project a bold and extroverted image. They attract a lot of attention. I created some smiles like this, because some of my patients wanted that kind of a look. Most of them, however, wanted teeth a little more subdued and natural-looking. This is how we are trained in dental school – the dentist’s judgment should prevail, and to listen to the patient about how they want this done is “pandering” and unprofessional. She repeats this phrase – “my professional opinion.” You just have an opinion, she has a professional opinion. And you’re never going to get her past that. And what makes it especially difficult, is that MOST dentists think that way. I looked at her website. I see she is a specialist – a periodontist – which makes it even more difficult, as specialists are even more entrenched in this thinking. See what our recommended cosmetic dentist can do for you – I wish you well. Other links: Read about the art of smile design. Read about the difference between a true cosmetic dentist and a general dentist.